For other uses, see Street (disambiguation). 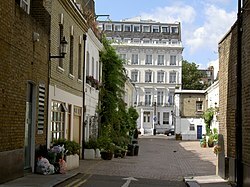 Typical service street ("mews") in the Royal Borough of Kensington and Chelsea in London. Mews are typically found at the back of older housing terraces (rows of townhouses) in the UK, with a more elegant street in front of the terrace. A street is a public thoroughfare in a built environment. It is a public parcel of land adjoining buildings in an urban context, on which people may freely assemble, interact, and move about. A street can be as simple as a level patch of dirt, but is more often paved with a hard, durable surface such as tarmac, concrete, cobblestone or brick. Portions may also be smoothed with asphalt, embedded with rails, or otherwise prepared to accommodate non-pedestrian traffic. Originally, the word street simply meant a paved road (Latin: via strata). The word street is still sometimes used colloquially as a synonym for road, for example in connection with the ancient Watling Street, but city residents and urban planners draw a crucial modern distinction: a road's main function is transportation, while streets facilitate public interaction. Examples of streets include pedestrian streets, alleys, and city-centre streets too crowded for road vehicles to pass. 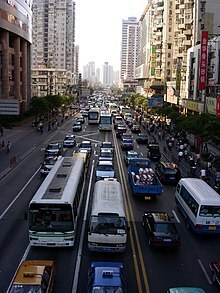 Conversely, highways and motorways are types of roads, but few would refer to them as streets. 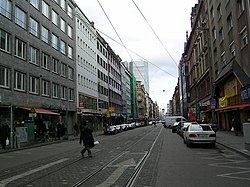 A city-centre street in Frankfurt, Germany. The Porta Rosa was the main street of Elea, connecting the northern quarter with the southern quarter. The street is 5 meters wide and has an incline of 18 % in the steepest part. It is paved with limestone blocks, griders cut in square blocks, and on one side a small gutter for the drainage of rain water. The building is dated during the time of the reorganization of the city during the Hellenistic age (4th–3rd centuries BC). The word street has its origins in the Latin strata (meaning "paved road" - abbreviation from via strata); it is thus related to stratum and stratification. The first recorded use of word stratæ referring to the road has been made by the Eutropius. Ancient Greek stratos means army: Greeks originally built roads to move their armies. Old English applied the word to Roman roads in Britain such as Ermine Street, Watling Street, etc. Later it acquired a dialectical meaning of "straggling village", which were often laid out on the verges of Roman roads and these settlements often became named Stretton. In the Middle Ages, a road was a way people travelled, with street applied specifically to paved ways. 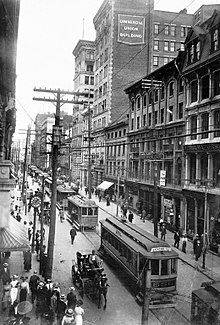 Rue Saint-Jacques, a street in Montreal, 1910. The street is a public easement, one of the few shared between all sorts of people. As a component of the built environment as ancient as human habitation, the street sustains a range of activities vital to civilization. Its roles are as numerous and diverse as its ever-changing cast of characters. Streets can be loosely categorized as main streets and side streets. Main streets are usually broad with a relatively high level of activity. Commerce and public interaction are more visible on main streets, and vehicles may use them for longer-distance travel. Side streets are quieter, often residential in use and character, and may be used for vehicular parking. Circulation, or less broadly, transportation, is perhaps a street's most visible use, and certainly among the most important. The unrestricted movement of people and goods within a city is essential to its commerce and vitality, and streets provide the physical space for this activity. In the interest of order and efficiency, an effort may be made to segregate different types of traffic. This is usually done by carving a road through the middle for motorists, reserving pavements on either side for pedestrians; other arrangements allow for streetcars, trolleys, and even wastewater and rainfall runoff ditches (common in Japan and India). In the mid-20th century, as the automobile threatened to overwhelm city streets with pollution and ghastly accidents, many urban theorists came to see this segregation as not only helpful but necessary in order to maintain mobility. Le Corbusier, for one, perceived an ever-stricter segregation of traffic as an essential affirmation of social order—a desirable, and ultimately inevitable, expression of modernity. To this end, proposals were advanced to build "vertical streets" where road vehicles, pedestrians, and trains would each occupy their own levels. Such an arrangement, it was said, would allow for even denser development in the future. These plans were never implemented comprehensively, a fact which today's urban theorists regard as fortunate for vitality and diversity. Rather, vertical segregation is applied on a piecemeal basis, as in sewers, utility poles, depressed highways, elevated railways, common utility ducts, the extensive complex of underground malls surrounding Tokyo Station and the Ōtemachi subway station, the elevated pedestrian skyway networks of Minneapolis and Calgary, the underground cities of Atlanta and Montreal, and the multilevel streets in Chicago. Transportation is often misunderstood to be the defining characteristic, or even the sole purpose, of a street. This has not been the case since the word "street" came to be limited to urban situations, and even in the automobile age, is still demonstrably false. A street may be temporarily blocked to all through traffic in order to secure the space for other uses, such as a street fair, a flea market, children at play, filming a movie, or construction work. Many streets are bracketed by bollards or Jersey barriers so as to keep out vehicles. These measures are often taken in a city's busiest areas, the "destination" districts, when the volume of activity outgrows the capacity of private passenger vehicles to support it. A feature universal to all streets is a human-scale design that gives its users the space and security to feel engaged in their surroundings, whatever through traffic may pass. 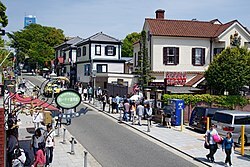 Kitano Street in Kobe, Hyogo, Japan. An empty street in Misasa, Tottori, Japan. Despite this, the operator of a motor vehicle may (incompletely) regard a street as merely a thoroughfare for vehicular travel or parking. As far as concerns the driver, a street can be one-way or two-way: vehicles on one-way streets may travel in only one direction, while those on two-way streets may travel both ways. One way streets typically have signs reading "ONE WAY" and an arrow showing the direction of allowed travel. Most two-way streets are wide enough for at least two lanes of traffic. Which lane is for which direction of traffic depends on what country the street is located in. On broader two-way streets, there is often a centre line marked down the middle of the street separating those lanes on which vehicular traffic goes in one direction from other lanes in which traffic goes in the opposite direction. Occasionally, there may be a median strip separating lanes of opposing traffic. If there is more than one lane going in one direction on a main street, these lanes may be separated by intermittent lane lines, marked on the street pavement. Side streets often do not have centre lines or lane lines. Many streets, especially side streets in residential areas, have an extra lane's width on one or both sides for parallel parking. Most minor side streets allowing free parallel parking do not have pavement markings designating the parking lane. Main streets more often have parking lanes marked. Some streets are too busy or narrow for parking on the side. Sometimes parking on the sides of streets is allowed only at certain times. Curbside signs often state regulations about parking. Some streets, particularly in business areas, may have parking meters into which coins must be paid to allow parking in the adjacent space for a limited time. Other parking meters work on a credit card and ticket basis or pay and display. Parking lane markings on the pavement may designate the meter corresponding to a parking space. Some wide streets with light traffic allow angle parking or herringbone parking. Sidewalks (US usage) or pavements (UK usage) are often located alongside on one or usually both sides of the street within the public land strips beyond the curbs. Sidewalks serve a traffic purpose, by making walking easier and more attractive, but they also serve a social function, allowing neighbors to meet and interact on their walks. 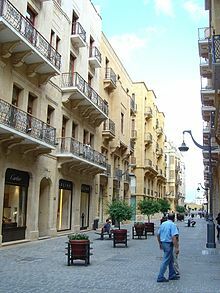 They also can foster economic activity, such as window shopping and sidewalk cafes. Some studies have found that shops on streets with sidewalks get more customers than similar shops without sidewalks. An important element of sidewalk design is accessibility for persons with disabilities. Features that make sidewalks more accessible include curb ramps, tactile paving and accessible traffic signals. The Americans with Disabilities Act requires accessibility improvement on new and reconstructed streets within the US. In most jurisdictions, bicycles are legally allowed to use streets, and required to follow the same traffic laws as motor vehicle traffic. Where the volume of bicycle traffic warrants and available right-of-way allows, provisions may be made to separate cyclists from motor vehicle traffic. Wider lanes may be provided next to the curb, or shoulders may be provided. Bicycle lanes may be used on busy streets to provide some separation between bicycle traffic and motor vehicle traffic. The bicycle lane may be placed between the travel lanes and the parking lanes, between the parking lanes and the curb, or for increased safety for cyclists, between curb and sidewalk. These poorer designs can lead to Dooring incidents and are unsafe for cycling. A more sensible design is found in the Netherlands with a Protected Bicycle Path totally separate from the traffic which is safe for cycling. Safe from traffic for cycling along a fully segregated Fietspad, properly designed cycling infrastructure in Amsterdam. Trams are generally considered to be environmentally friendly with tramlines running in streets with a combination of tram lanes or separate alignments are used, sometimes on a segregated right of way. Signalling and effective braking reduce the risk of a tram accident. Often, a curb (British English: Kerb) is used to separate the vehicle traffic lanes from the adjacent pavement area and where people on bicycles are considered properly are used to separate cycling from traffic as well. Street signs, parking meters, bicycle stands, benches, traffic signals, and street lights are often found adjacent to streets. They may be behind the sidewalk, or between the sidewalk and the curb. There may be a road verge (a strip of grass or other vegetation) between the carriageway (North American English: Roadway) and the pavement on either side of the street on which Grass or trees are often grown there for landscaping. These are often placed for beautification, but are increasingly being used to control stormwater. Although primarily used for traffic, streets are important corridors for utilities such as electric power; communications such as telephone, cable television and fiber optic lines; storm and sanitary sewers; and natural gas lines. Damrak, in Amsterdam with a tram, Fietspad and pavement. Practically all public streets in Western countries and the majority elsewhere (though not in Japan; see Japanese addressing system) are given a street or road name, or at least a number, to identify them and any addresses located along the streets. Alleys, in some places, do not have names. The length of a lot of land along a street is referred to as the frontage of the lot. A street may assume the role of a town square for its regulars. Jane Jacobs, an economist and prominent urbanist, wrote extensively on the ways that interaction among the people who live and work on a particular street—"eyes on the street"—can reduce crime, encourage the exchange of ideas, and generally make the world a better place. A street can often serve as the catalyst for the neighborhood's prosperity, culture and solidarity. New Orleans’ Bourbon Street is famous not only for its active nightlife but also for its role as the center of the city's French Quarter. Similarly, the Bowery has at various times been New York City's theater district, red-light district, skid row, restaurant supply district, and the center of the nation's underground punk scene. Madison Avenue and Fleet Street are so strongly identified with their respective most famous types of commerce, that their names are sometimes applied to firms located elsewhere. Other streets mark divisions between neighborhoods of a city. For example, Yonge Street divides Toronto into east and west sides, and East Capitol Street divides Washington, D.C. into north and south. 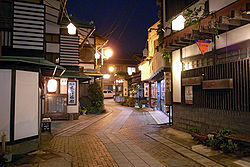 Some streets are associated with the beautification of a town or city. Greenwood, Mississippi's Grand Boulevard was once named one of America's ten most beautiful streets by the U.S. Chambers of Commerce and the Garden Clubs of America. The 1,000 oak trees lining Grand Boulevard were planted in 1916 by Sally Humphreys Gwin, a charter member of the Greenwood Garden Club. In 1950, Gwin received a citation from the National Congress of the Daughters of the American Revolution in recognition of her work in the conservation of trees. Streets also tend to aggregate establishments of similar nature and character. East 9th Street in Manhattan, for example, offers a cluster of Japanese restaurants, clothing stores, and cultural venues. In Washington, D.C., 17th Street and P Street are well known as epicenters of the city's (relatively small) gay culture. Many cities have a Radio Row or Restaurant Row. Like in Philadelphia there is a small street called Jewelers' row giving the identity of a "Diamond district". This phenomenon is the subject of urban location theory in economics. In Cleveland, Ohio, East 4th Street has become restaurant row for Cleveland. On East 4th is Michael Symon's Lola Bistro and other restaurants. A road, like a street, is often paved and used for travel. However, a street is characterized by the degree and quality of street life it facilitates, whereas a road serves primarily as a through passage for road vehicles or (less frequently) pedestrians. Buskers, beggars, boulevardiers, patrons of pavement cafés, peoplewatchers, streetwalkers, and a diversity of other characters are habitual users of a street; the same people would not typically be found on a road. In rural and suburban environments where street life is rare, the terms "street" and "road" are frequently considered interchangeable. Still, even here, what is called a "street" is usually a smaller thoroughfare, such as a road within a housing development feeding directly into individual driveways. In the last half of the 20th century these streets often abandoned the tradition of a rigid, rectangular grid, and instead were designed to discourage through traffic. This and other traffic calming methods provided quiet for families and play space for children. Adolescent suburbanites find, in attenuated form, the amenities of street life in shopping malls where vehicles are forbidden. A town square or plaza is a little more like a street, but a town square is rarely paved with asphalt and may not make any concessions for through traffic at all. 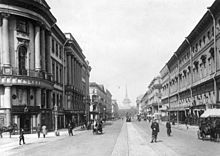 Nevsky Prospekt, is the main street in the city of St. Petersburg, 1901. 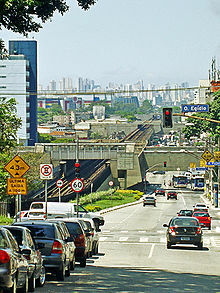 An avenue in São Paulo. There is a haphazard relationship, at best, between a thoroughfare's function and its name. 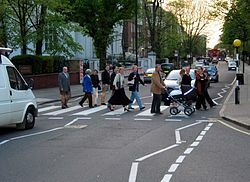 For example, London's Abbey Road serves all the vital functions of a street, despite its name, and locals are more apt to refer to the "street" outside than the "road". A desolate road in rural Montana, on the other hand, may bear a sign proclaiming it "Davidson Street", but this does not make it a "street" except in the original sense of a paved road. In the United Kingdom many towns will refer to their main thoroughfare as the High Street (in the United States and Canada it would be called the Main Street—however, occasionally "Main Street" in a city or town is a street other than the de facto main thoroughfare), and many of the ways leading off it will be named "Road" despite the urban setting. Thus the town's so-called "Roads" will actually be more street like than a road. Some streets may even be called highways. For example, Hurontario Street in Mississauga, Ontario, Canada, is commonly referred to as "Highway 10"—even though such a highway designation no longer officially exists through the city. This is probably because the street is a modern suburban arterial that was urbanized after decades of having the status and function of a true highway, so people continue to use the number from force of habit. In some other English-speaking countries, such as Australia and New Zealand, cities are often divided by a main "Road", with "Streets" leading from this "Road", or the cities are divided by thoroughfares known as "Streets" or "Roads" with no apparent differentiation between the two. In Auckland, for example, the main shopping precinct is located around Queen Street and Karangahape Road. Streets have existed for as long as humans have lived in permanent settlements (see civilization). However, modern civilization in much of the New World developed around transportation provided by motor vehicles. In some parts of the English-speaking world, such as North America, many think of the street as a thoroughfare for vehicular traffic first and foremost. In this view, pedestrian traffic is incidental to the street's purpose; a street consists of a thoroughfare running through the middle (in essence, a road), and may or may not have pavements (i.e., sidewalks) along the sides. In an even narrower sense, some may think of a street as only the vehicle-driven and parking part of the thoroughfare. Thus, sidewalks (pavements) and road verges would not be thought of as part of the street. A mother may tell her toddlers, "Don't go out into the street, so you don't get hit by a car." Among urban residents of the English-speaking world, the word "street" appears to carry its original connotations (i.e., the facilitation of traffic as a prime purpose, and "street life" as an incidental benefit). For instance, a New York Times writer lets casually slip the observation that automobile-laden Houston Street, in lower Manhattan, is "a street that can hardly be called 'street' anymore, transformed years ago into an eight-lane raceway that alternately resembles a Nascar event and a parking lot." Published in the paper's Metro section, the article evidently presumes an audience with an innate grasp of the modern urban role of the street. To the readers of the Metro section, vehicular traffic does not reinforce, but rather detracts from, the essential "street-ness" of a street. At least one map has been made to illustrate the geography of naming conventions for thoroughfares; avenue, boulevard, circle, road, street, and other suffixes are compared and contrasted. Happy street, alternatively called open street or fun street, are open to all public celebrations organised in many European and Indian cities; mostly on some Sunday or some other specific day, initiative encourages people to use non-motorised transport and to come out onto the streets to socialize every Sunday morning through a wide array of activities; Where in families and people of all ages can simply get out in the middle of the street to walk, run, jog, dance, bicycle, sing, skate or play. Happy Street comes to different areas on the some specific Sunday of every month. Several cities across India including Kolkata, Pune, Thane, Ahmedabad, Madurai, BengloreVisakhapatnam have been successfully implementing it while places like Chennai and Coimbatore have introduced car-free Sundays. Wikimedia Commons has media related to Street. ^ Road vs Street at Using English forum. ^ Avenue vs Street at Using English forum. ^ Guest, Edwin (1852). "On certain Foreign Terms, adopted by our Ancestors prior to their Settlement in the British Islands (Pt. II)". Proceedings of the Philological Society. 5 (124): 188. ^ "Online Etymology". Retrieved 2006-11-14. ^ "Economic Revitalization". Archived from the original on 2011-07-17. Retrieved 2011-07-15. ^ "Tram – Definition and More from the Free Merriam-Webster Dictionary". merriam-webster.com. Archived from the original on 9 April 2015. ^ "NewspaperArchive® - Genealogy & Family History Records". www.newspaperarchive.com. ^ Kirkpatrick, Mario Carter. Mississippi Off the Beaten Path. GPP Travel, 2007. ^ Bill Rankin (2005). "Vancouver Roads". radicalcartography. Retrieved 2010-06-19. ^ a b c "Happy Street: Latest News, Videos and Photos - Times of India". The Times of India. Retrieved 23 December 2017. ^ a b c d Basu, Soma (31 March 2017). "Happiness on the street". Retrieved 23 December 2017 – via www.thehindu.com. ^ "One woman's simple recipe for a happy street". BBC News. Retrieved 23 December 2017. ^ http://www.facebook.com/Millennium-Post-1121157364607635/. "Elgin Road to take on the garb of 'Fun Street' on Christmas eve". millenniumpost.in. Retrieved 23 December 2017. ^ "Bengaluru: Commercial street becomes 'Happy Street' for a day!". deccanchronicle.com. 28 March 2016. ^ "RK Beach to showcase North Coastal traditions". The Hans India. ^ "Metro Detroiters drawn to open street festival". detroitnews.com. ^ "Switch Open Street Sunday takes on Halifax". thechronicleherald.ca. 18 September 2017. AskOxford: What is the difference between a 'street' and a 'road'? Biannual exhibition of poetry and documentary about streets and traffic. What distinguishes a street from a lane from a road from a boulevard, etc.? – An Ask Yahoo! editor's examination of the issue. A Treatise on Highway Construction, Designed as a Text-book and Work of Reference for All who May be Engaged in the Location, Construction, Or Maintenance of Roads, Streets, and Pavements, By Austin Thomas Byrne, 1900 – Boston appears to be the first city in the United States to pave its streets, by 1663, many with pebbles.